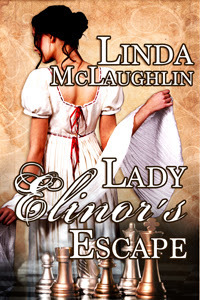 Today we sit down with Stephen Chaplin from Lady Elinor’s Escape by author Linda McLaughlin. I pride myself on my honor and integrity. My inability to resist a damsel in distress, as it caused me many difficulties during Lady Elinor’s Escape. She made me fall in love with a lady far above my touch. An Earl’s daughter, no less! Alas, there’s no point in arguing with her. I fear that my author will match my sister Olivia with my oldest enemy in the next book. I pray she never writes it. I would change the part where I fail to recognize the woman I love at a masquerade. How could the author think I could be so clueless? I might be persuaded to change places with my law partner, Owen Tudor. To date, his life has been almost entirely without drama. She tells me it’s https://lindalyndi.com, though I have no idea what a website/blog, is. I have no idea. It’s all up to my nefarious author! Stephen Chaplin is a "true" hero! And Lois, thank you for hosting me and Stephen. Always happy to have you stop by, Lyndi!